Raised on a lifelong media diet of “good” and “bad” foods, some Americans tend to approach the dinner table in a state of panic. Harvey Levenstein was inspired to write Fear of Food while researching American tourism in France. There he noticed some Americans' feared French foods, and by extension, of eating in general. This led him to study the seesaw-nature of American nutritional information, and how that seesaw created persisting anxiety about what we eat. Levenstein’s book isn’t for everyone.That’s not a criticism. 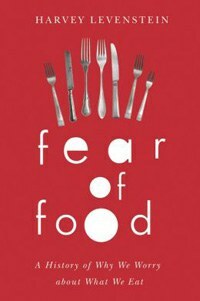 Fear of Food is an interesting, thorough review of American food phobias, but it’s neither light nor cheerful reading. Levenstein’s writing is accessible to the non-academic, but you have to be deeply interested in food and nutritional history even to pick it up. Interested types will be rewarded with historical insight into a national anxiety attack. Raised on a lifelong media diet of “good” and “bad” foods, some Americans approach the dinner table in a state of panic. Incredibly, this state has persisted for over a century. Levenstein’s study begins in the late 1800s, concluding in the 2000s. Early information about nutrition was misguided, in fact often completely inaccurate. Given the dearth of scientific knowledge in the late 19th and early 20th century, this is unsurprising. What is shocking is our continuing inability to definitively understand the links between nutrition and health. During my '70s childhood, eggs and butter were demonized, while margarine and corn oils were deemed healthy choices. Current medical research now suggest that butter is healthier than the trans fats found in many butter replacements, while eggs are recognized as a healthy protein source. Carbohydrates are the new poison; the debate on fats has never ceased. Where early 20th century scientists advocated cutting “bad” fat by eating a “Mediterranean Diet” (sound familiar? ), we are now prescribed cholesterol-busting drugs. Oh, and the Mediterranean Diet. Levenstein begins in the late 1800s, when immigration brought intense overcrowding and attendant illness to cities. As deeper understanding of germs, bacteria, and the dangers of horse manure -- then a fixture of city life -- increased, scientists and the federal government made efforts to educate the populace about hand washing and kitchen sanitation. Scientists attributed much illness to houseflies, which were drawn by the manure. Cats and dogs also came under attack as a source for germs, to the point of mass executions. The advent of the motor vehicle meant fewer horses, less dung and fewer flies. But the war on food safety had barely begun. In those nascent years of the FDA and Department of Agriculture, foods were increasingly moving from home or locally grown to purchased, pre-packaged items. These newly available foods were often poorly canned, packed, and/or highly adulterated. Milk was a highly controversial food -- one that remains so. Feared as a carrier of Typhoid, bacteria-laden milk was blamed for a high infant mortality rate. Louis Pasteur’s invention should have changed this, but the argument was less about health than money -- asteurization was expensive, available only to enormous dairy businesses, shoving out the small suppliers, who protested mightily. In “Autointoxication and Its Discontents”, Levenstein details America’s first yogurt craze. The Russian scientist Elie Metchnikoff earned a Nobel Prize for discovered phagocytes in the blood. From there he derailed, deciding the large intestine was a vestigial organ poisoning the body by holding feces, shortening life via “autointoxication”. He advocated removal of the offending organ. An English surgeon, Sir William Arbuthnot-Lane, did just that to 50 patients, nine of whom died. In lieu of radical procedures, Metchnikoff settled on yogurt consumption. He was certain it would allow people to live happily and healthily for 140 years. He cited Balkan peasants who lived to amazingly old ages, evidently failing to realize many were named after fathers or grandfathers, and were families rather than individuals. Metchnikoff died at 71; a poor advertisement for his nostrums. Levenstein writes that constipation was a problem due to the American diet, which shunned fruits and vegetables in favor of high beef consumption. This led the way for John Harvey Kellogg’s sanitarium, with its appalling food and perhaps more appalling obsession with elimination. Adulterated foods were a serious problem. Levenstein goes into detail about Chemistry professor Harvey Wiley, a crusader for the Food and Drug Act of 1906, which demanded food labeling. It was unclear whether common food additives like boric acid and food colorings were dangerous, so Wiley rounded up willing young men to act as “poison squads”, eating foods containing offending additives for long periods. These experiments were poorly created and monitored. Fortunately, the young men were not sickened. As large food companies came into being, they got into bed with people like Wiley, impacting legislation about specific products like Heinz catsup, leading the reader to marvel yet again at how little has changed. Canned and processed foods, besides containing dubious chemicals, were considered denatured. Vitamins, newly discovered in 1911, were deemed essential to good health. Food producers argued with scientists, enriched their flours and cereals, and made all manner of unsubstantiated claims. Meanwhile, a rotating cast of scientists moved from roles as arbiters to being shunned by peers. “Natural Foods In Shangri-La” is an especially timely chapter. It chronicles the rise of J.I. Rodale, née Jerome Irving Cohen. Rodale was an early convert to organic eating, then virtually unknown. He began paying attention to enthusiastic literature attesting the Hunza people of Pakistan, who ate little animal protein or dairy, experienced wondrous health and grand old age. Even when this was roundly disproved by visiting scientists, who saw a parade of seriously ill, malnourished Hunzakut, the myth persisted. Rodale built an empire around them with magazines and publications on organic farming, which caught on with the counterculture movement of the '60s. Rodale’s son, Robert, was an early locavore who extolled the benefits of exercise long before a gym membership was de rigueur. “Lipophobia” sheds light on the still-raging cholesterol wars, how they came to exist, and the still-dicey connections between fat intake and heart disease. Poor science did not stop scientists like Ancel Keys, the first promoter of the Mediterranean Diet, or Dr. Paul Dudley White. What neither failed to see was better medicine meant more people were surviving childhood only to suffer adult illnesses like heart disease. John Yudkin, an early voice in the wilderness, tried to bring the dangers of high sugar intake to the public’s attention, only to be excoriated by his peers. I finished Fear of Food feeling amazed at how little nutritional fears, misinformation, and food scares have changed since the late 1800s. Advances in science mean contemporary Americans have access to information our grandparents knew nothing of, yet we are no further ahead in the nutrition wars. We latch on to diets—South Beach, Atkins, Mediterranean, Flexitarian, Weston Price, vegan, vegetarian—in the hopes of health, prolonged youth, and slenderness. We starve and stuff ourselves. And yet, we get sick. We fall ill with diseases, some incurable. We become injured. And inevitably, no matter what we eat, we die. As of this moment, butter and eggs are our friends; margarine and corn-based foodstuffs our enemies. Perhaps Levenstein, in this confused and confusing era, is right to invoke Julia Child. May as well drench your chard with cream sauce and hope for the best.